The prospect of website content writing may seem overwhelming, especially if you’re starting a website from scratch or overhauling a current one. What may be confusing you is not so much writing individual pages themselves, but how to figure out what pages to include and how to organize all the material. Business site: its purpose is to be your business’s online calling card. Anyone doing business needs a business website. Yours can be basic or detailed or anywhere in between. Information site: its purpose is to offer information about a specific topic or niche (like Tomato Dirt) or curated content from different sources (like Buzz Feed). Blog: its purpose is to serve as a personal opinion platform or online journal to build readership for your message. Retail site: its purpose is to provide a commercial hub (think Amazon or Walmart). Personal site: its purpose is to share information with family, friends, or a specific group of insiders. Your website can have more than one purpose. But of those, one must be primary and override the others. Decide what your site’s purpose is. 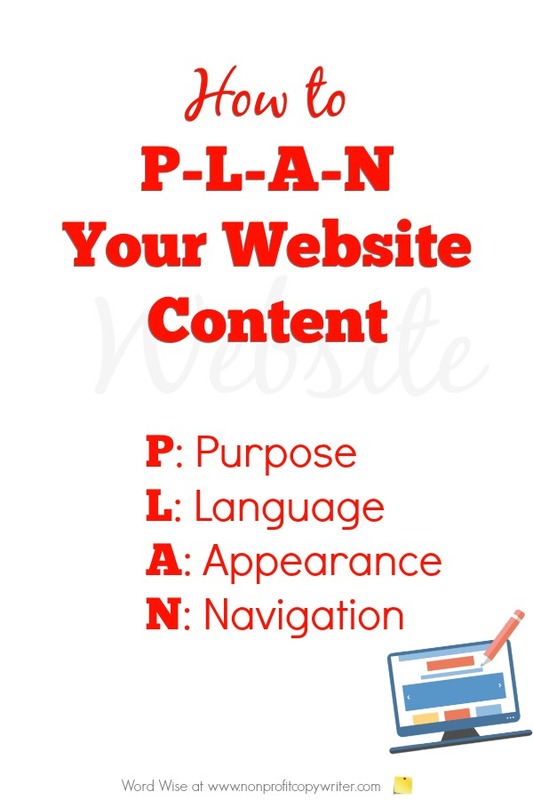 Keep that purpose in mind as you create your site outline (see #4 Navigation, below.) Then begin to drill down the language you will use as you write it. Writing Tip: Know why you’re writing the site. As you consider what pages to include on your site, research your topic’s anchor language. “Anchor language” – or keywords – are terms and phrases specific to your content. Readers use keywords to search for information online. Keywords help drive readers to your website, blog, or social media platform. For instance, one of the main keyword phrases for Nonprofit Copywriter is “writing tips.” You’ll see that I sprinkle that phrase and its variations in page titles and in page content across this site. To start a list of relevant keywords for your site topic, you can use a free tool like Google Keyword Planner. My favorite approach, especially for larger sites: I use Solo Build It (SBI) as my website host and website builder. SBI is not only affordable, but also does all the keyword research for me in its Brainstorm function. Writing Tip: Gather your keywords. Web writing has three distinct attributes: it’s easy to skim, easy to read, and easy to re-use (read more about each of these in detail.) And these days, your website content writing plan should include images and video, too. Writing Tip: Write simply and clearly. Appearance matters. I compare navigation to an outline. Know how to write an outline and you know how to plan your website’s navigation. That’s incredibly helpful when planning your website content, isn’t it? A navigation menu appears as a collection of links horizontally across the top of a website, vertically as a column, or even as clickable boxes. Use your keyword list to create your navigation menu! By this I mean choose names for navigation links purposefully from your keyword list. And choose page names, also, from your keyword list. Writing Tip: Make an outline to use as the site’s navigation. Then start by adding just a few pages (even just your home page) and add more, one at a time, to your website. Each page needn’t be that long – just 400 words. Add a little at a time, consistently over time. Soon you’ll look back and see how your plan helped you build a quality website.